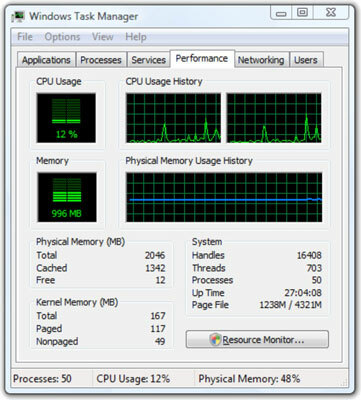 If you want to speed up your computer, you need to know how to use the Task Manager to monitor computer status in Windows Vista. Previous versions of Windows hid performance data in dozens of obscure nooks and crannies, but in Vista, the tools you need to highlight the laggards sit just a few clicks away. Be suspicious of claims that you can speed up Vista by disabling some specific service or making some simple Registry change. Some people might try to convince you that axing some obscure piece of Vista or lopping off a program that performs duties beyond the ken of mortals somehow makes the system faster and more secure. These same people seem mystified when Vista suddenly stops working. If you’ve ever come face to face with the Vista circle-chasing-its-tail cursor and watched and watched as your system seemingly did absolutely nothing, there are things you can do that may make you feel better. The Task Manager is a good place to start. Click Start, type taskmgr in the Start Search text box, and press Enter. Press Ctrl+Alt+Del and then select Start Task Manager from the logon screen menu. Choose Start→Control Panel→System and Maintenance→Performance Information and Tools. From the resulting dialog box, click the link at the bottom marked Advanced Tools. Then click Open Task Manager. When the Task Manager is up and alive, click the Performance tab to watch your computer’s CPU chug away, and follow the bobbing line that shows the percentage of memory being used. The Task Manager shows you how hard the computer is working and how much memory it takes. 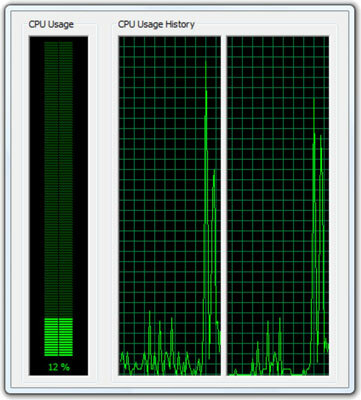 Usually, the Task Manager reports on CPU usage every two seconds. To increase the sampling rate to twice per second, choose View→Update Speed→High. To decrease it to once every four seconds, choose View→Update Speed→Low. To see the Task Manager’s CPU history graph in considerably greater detail, double-click anywhere in the upper part of the dialog box. The Task Manager turns into a very simple box that you can move anywhere on the desktop or resize by dragging the edges or corners. To bring the normal Task Manager back double-click anywhere on the expanded box. Although some people like to keep an eye on CPU usage just to see how fast the grass grows, most people are on the lookout for something really going haywire. If your CPU usage goes up to 100% when you start a program and stays there for more than a few seconds, something is probably wrong — a lot of overheard from old, unused add-ons, for example, or maybe a startup file that has grown too large. If CPU usage pegs at 100% for more than a minute, when you’ve never had a problem before, Windows Vista itself could be the culprit. Microsoft has released several faulty patches that drive applications up to 100% CPU usage for extended periods. If you suspect a bad patch, go online and ask.